In this video I’m going to teach you how you can become an SEO expert. 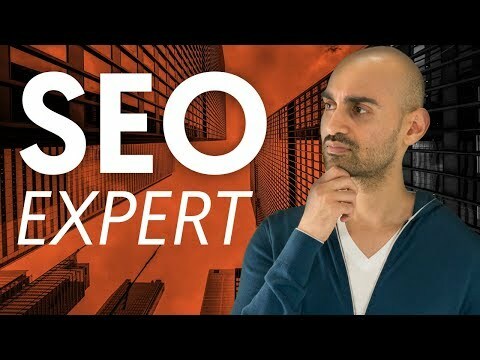 Do want to learn how to be an SEO expert like me, Neil Patel? SEO isn’t hard to learn, it just takes practice and passion. Today I’ll share with you my 8 steps to becoming an SEO expert in 2019. I’m going to share with you what type of mindset, passion, and love you need to have to really learn all about search engine optimization. From building your website, writing content, and getting your links out there to rank on Google. This will be the best SEO tutorial you watch on YouTube. The first thing you need to do is make sure you truly love SEO, you wanna do it, and you wanna get good at it. The second thing you need to do is set up a website. Go to wordpress.org or wordpress.com, set up your own website. It could be a blog, could be a blogging platform, it doesn’t matter. That’s just the first thing you need to do. Without your own website, you won’t know how to implement these tactics, practice, or get good at it. The third thing you need to do is write content. When you have your website, if you don’t have content, you’re not gonna rank. As the saying goes, content is king. Publish content on whatever you’re passionate about. The fourth thing is you need to build links. When it comes to building links, if no one’s linking to your website, you won’t rank. Then, when you take those articles, you can put ’em into Ahrefs. It’ll show you all the people linking to ’em. On top of links, you now need to then start getting social shares. Then, I want you to follow all the popular marketing blogs, from Backlinko to Moz, to hey, even me, neilpatel.com. All of these marketing blogs will break out the latest and greatest tactics and techniques. By reading ’em on a regular basis, you’ll learn ’em, you’ll stay on top of the curve, so that way, you’ll do better than most people in the SEO industry. And last but not least, be patient. You’re not gonna climb to the top of Google in a month, or even three months or six months. It takes longer and longer each and every single year because the web is more competitive. There’s roughly 1.7 or 1.8 billion websites on the Internet. That’s roughly four websites, technically one website for every four people. That’s a lot of websites, and blogs, there’s over a billion. That’s roughly one blog for every seven people. That’s too many sites to choose from. Because that Google now says, hey, there’s a lot of people talking about the same content over and over again, let’s pick the ones that are more up-to-date or more authority. It makes it that much harder for you to get rankings. For that reason, you need to learn to be patient. If you do this consistently for six months to a year, you’ll get results.